A few years ago, I thought I may have found it. It appeared on my plate in the most unlikely of places – Fornelletto – a fine dining establishment at the Borgata in Atlantic City that specializes in Southern Italian cuisine. There I took a chance on their Tuscan Fried Chicken – and the drool-inducing blend of Italian-meets-KFC-spicing infused into a bird perfectly breaded and fried made me feel as if I had died and gone to heaven. I assumed my life-long search was finally over. But wait…the breading and the oil thickens. Just recently I found myself wandering the streets of Philadelphia bar-hopping with a friend on a chillaxed Sunday afternoon and while strolling through that magical land of bricks, cobblestones and hipsters between Society Hill and South Street, we stumbled across (and into) The Twisted Tail. Apart from weekly blues jam sessions on the second floor (and live music just about every night) – this Bourbon House and Juke Joint boasts a menu full of Southern Fried Goodness. I, of course – after almost fainting over the most heavenly hushpuppies – ordered the chicken and biscuits. Here they prove there is no such thing as over-seasoning fried chicken. Was that paprika I tasted amidst the tempered onslaught of salt, pepper and Old Bay rubbed into the most delectably fried breading? Crispy as all get-out and seasoned up to wazzoo…I thought…maybe this is it! But alas…coming down now from that fried chicken hangover made me realize that it’s not about the holy grail…it’s about the quest. And my quest should never end. 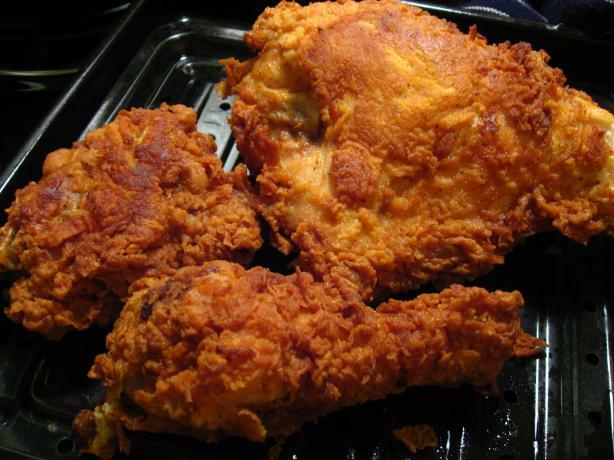 So I ask you my readers and fellow fine feathered friends…what’s the best fried chicken you’ve ever had? And where did you have it? It matters not from where you hail…leave your dining recommendations and/or recipes in the comment form. Fevered fried chicken dreams brought to you by David H. Schleicher. This entry was posted in Dining Out, Inspiration, Travel and tagged Atlantic City, Blues, Daniel Plainview, Fornelletto, Fried Chicken, Kenny Rogers, Paula Deen, Philadelphia, Seinfeld, Southern Cooking, Southern Fried Chicken, The Borgata, The Greatest Fried Chicken in the World, The Twisted Tail, Tuscan Fried Chicken. Luckily, my residence in the Southeast should give me some opportunity to correct this soon! I suppose! Still, it was a good reminder. Since I’ve moved to East TN, I’ve been in search of good BBQ. But seeking out some good, non-chain fried chicken might get added to the list! In the movie “The Help” and from childhood memories, the only way to make GOOD fried chicken is to dip the chicken pieces in egg and milk, dredge the pieces in flour, salt, pepper and paprika (shake it all up in a paper bag) NO BREADCRUMBS PLEASE, and fry it all up in a (and this is the most important part) black iron skillet in CRISCO. Make sure the skillet is hot and the crisco is bubbling before you add your chicken or you will loose your coating. ENJOY!